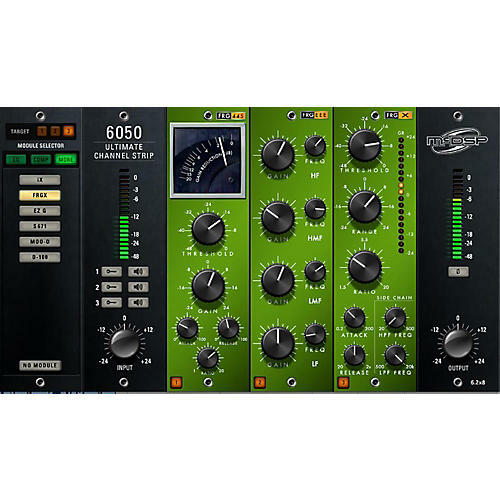 The 6050 Ultimate Channel Strip has input and output stages, wrapped around three module bays in which any of the 28 modules can be inserted. Easily drag and drop any module to rearrange the signal flow of your channel strip. A module selector panel allows quick auditioning of equalizers, compressors and additional effects. Like the original 6020 and 6030 plug-ins, each new module in the 6050 draws on classic and modern designs over the last four decades. Operation is simple and intuitive, and the sound quality is what professionals worldwide have come to know in McDSP plug-ins. Tracks needing a bit of grit will benefit from a touch up from the S671 saturation module. A Tone control is provided to taylor the ‘edge’ added by the S671 to a variety of applications. Upwards and downwards expansion is what the FRG X is all about. Up to 24 dB of signal cut or boost is available, along with a ratio control. Adjustable signal chain filtering is included.